I've been playing and writing songs since 1971. I have a B.A. with a Minor in Music from Millersville University of Pennsylvania. 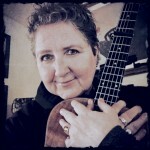 I'm primarily a singer/songwriter/performer, and am self-taught on guitar, ukulele, piano, bass, drums, blues harmonica, and banjo. I think music is amazing, and the more you learn about it, and the more music you can make, the more amazing it becomes. Helping people of all ages and sizes tap into the magic of music is thrilling to me. There can never be enough music in the world, so each time I help "make" a musician, I feel as if I've helped make the planet a better place. As I mentioned, I have a Bachelor of Arts degree from Millersville University of Pennsylvania with a minor in Music. My mom was an amazing musician who gave me some of her genes. She was a tremendous influence on my love of music. The music she grew up with and loved, was also shared with me, and helped shape my love of music. At the age of thirteen, I "borrowed" my little brother's guitar as he had discarded it upon finishing a guitar/accordion lesson package. I and "my" guitar disappeared into my room where I taught myself to play and write songs. I was a singer, but found it difficult to find accompaniment when I wanted to sing; thus, I became my own accompanist with my guitar. Over the years, I had a desire to expand my musical horizons, which is why I now play many instruments. I teach beginning and intermediate guitar and ukulele. Because I include music theory (the organization of music) almost from the beginning, my students are not locked into one particular genre. If a student is interested in one particular genre, then I will lean the lessons in that direction. Beginning and intermediate skill levels are welcome. I have on several occasions had students come to me with incredible skill, but they wanted to learn music theory in order to broaden their horizons. I have also, on occasion, been asked to coach advanced students who are working on performance pieces. I prefer students no younger than 7 years old, UNLESS, the child is mature for their age. Beyond starting ages, there is no age limit. I've had students in their seventies take lessons with me. I encourage younger and older students to try to learn an instrument because, aside from how much fun it can be, it's great for the brain and improving coordination skills. I was awarded the National School Choral Award (trust me, it's a big deal) as a senior in high school. In 2005 I was nominated as Best Female Singer/Songwriter for The Annual Coachella Valley Music Awards. Both honors were a complete surprise for me as I generally don't seek such things out. My influences are: Joni Mitchell, Janis Ian, The Beatles, Simon & Garfunkle, Peter, Paul & Mary, The Mamas & The Papas, Jim Croce, Fleetwood Mac, Johnny Cash... too many to list. I also grew up with a LOT of Big Band music in my household and all of the important singers of the 30's, 40's and 50's. Yes, those are names of yesteryear, but they are my foundation. Today, I listen to a wide range of music genres and am influenced to a certain degree by all of them. Let others know about Jules Hamland—Right Notes Music. Did this teacher help you to learn? How long did you take lessons? Are you still playing music? Share any thoughts or stories you have so that others can know about this teacher!